Pre heat the oven to 200°C / Gas mark 6. Mix the oats, oat bran, soft brown sugar, coconut, sunflower seeds and pumpkin seeds together in a large bowl. Melt the butter gently in a saucepan and mix in the dry ingredients. Tip into a baking tin 2.5cm deep. Press down and smooth out with the back of a metal spoon. Bake for 30-40 minutes until the flapjack begins to turn golden brown at the edges. 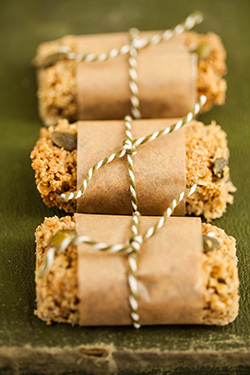 Cut into squares as soon as you remove the flapjack from the oven and leave to cool before removing from the tin.